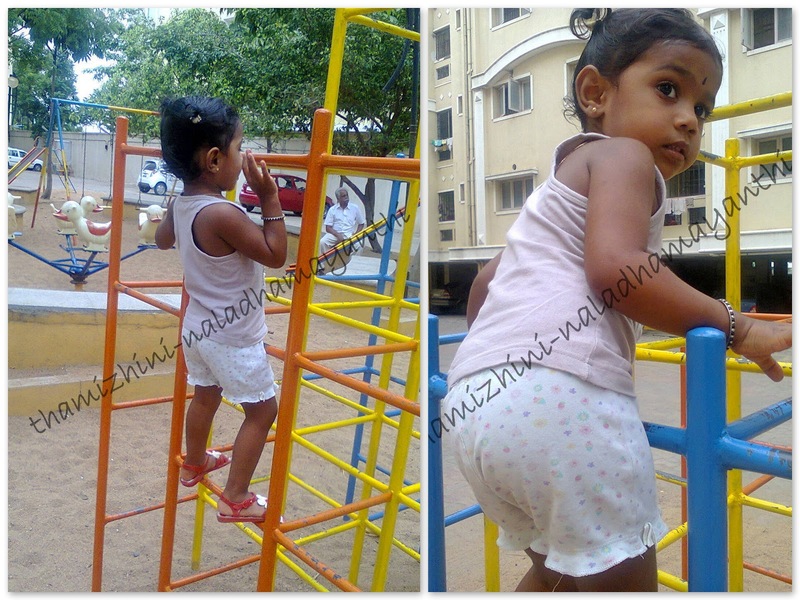 I need not worry about allowing Thamizhini to play, as our apartment has its own play area for kids. And Thamizhini for her 2.4 years, she has spent almost all her evenings here only. We started taking her out from her six months and till now she hasn't missed her play time, except few times due to cold / fever or gone out. 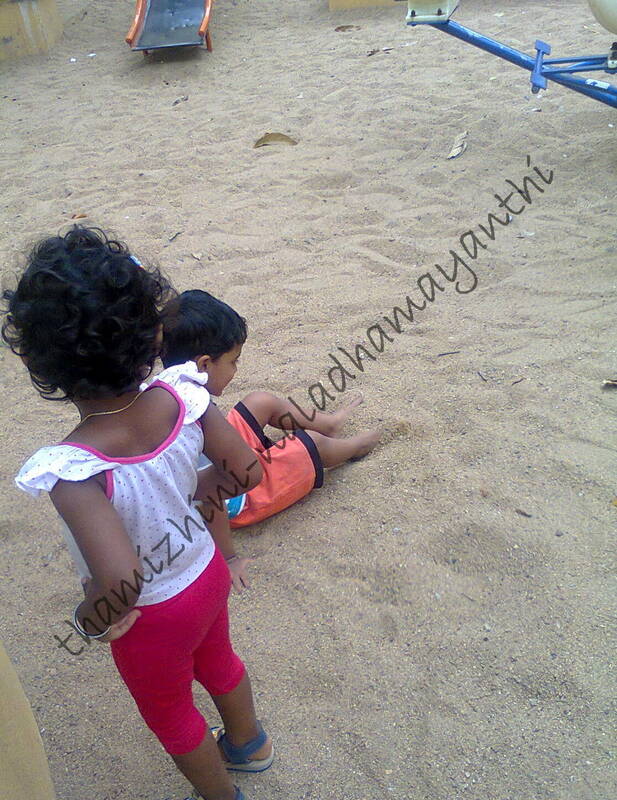 I'm really very much happy that Thamizhini enjoys her childhood with all time play. Kudos to my in laws and my parents, as they are the one who take her everyday to play. Apuchi, I'm grown up! I'm able to climb up! Most of the time Thamizhini's granny will accompany her, but once she is back from park, she used to illustrate all the things that happend in the park. All incidents would be lovely to hear from her and I would love to see her expressions when she talk about them. And of course most of the incidents are about complaining them. The one incident that she and me cannot forget in our life time is this. This happened around 2.5 months back, but still she remembers and tells me twice in a day. On that day, she casually came home from park after playing and while I was bathing her, she told me this. Thamizhini: Amma, Naren enakellam cycle kedaiyathunu sollitan. Me: Eh da apdi sonna? Thamizhini: Enakellam cycle kedaiyathunu sollitan. Me: (Repeating) Eh da apdi sonna? Of course there should be some naughty story behind this but she was not ready to share that. Even If I woke her up from sleep and ask, she will tell this. This has been carved in her heart I guess. 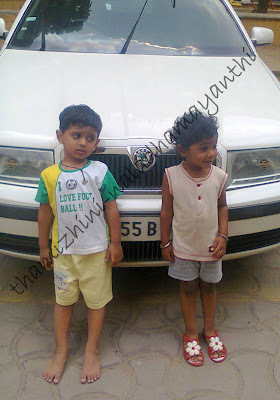 And these days, Naren become more dependent on Thamizhini and he comes our home by searching for her. And once he is in, he holds Thamizhini's hand and pulls by saying this: "Va Thamizhinii, Velayadam. Va polam." And for first few times she would look at me to seek permission from me. But these days, if he asks, she will run with him. She will not wait me or my mom to accompany her. We had to run behind them. And sometime they both play in our house and Thamizhini likes to share everything to him. In the evening, if Thamizhini is late to go to playground, Naren would come to the ground floor of our block and calls Thamizhini by saying her name. For first few times Thamizhini was not aware that he is calling her, but later whenever she hears her name, she tells us that "Naren Koopidran", even we would not have heard his sound. Moving on to Part II with few more cutest incidents!